BBC MUSIC DAY UNSUNG HERO... Denise White of Something Special. 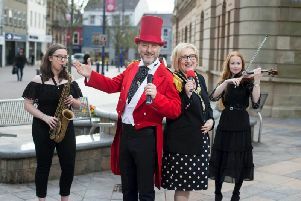 BBC One’s ‘The One Show’ have announced that Denise White, from Eglington in Co. Derry, is one of the five recipients of BBC Music Day’s inaugural Unsung Hero Award for work in their community with music. The Unsung Hero Award was launched as part of this year’s first ever BBC Music Day which will take place on Friday, June 5. It’s a nationwide celebration of music, aiming to bring people together across generations and communities through their love of music. The day will be reflected across BBC television and radio programmes with numerous events and concerts taking place in towns and cities in NI, England, Scotland and Wales. Denise White started ‘Something Special’ in April 2007 to improve the educational and social opportunities for young people and adults with learning disabilities. She realised the impact creativity and music had on their lives. Something Special focuses on using music as a way of consolidating learning, developing concentration, social interaction and developing creativity through innovative and intensive programmes. Today it is a multi-award winning organisation that provides training and accredited courses in music and performing arts to over 80 students. The students perform at events throughout Ireland and Britain and regularly showcase their music and talents to their local community, actively and proudly transforming lives, communities and perceptions. Denise says: “I could see that music worked some kind of magic with young people and that it could really change things for them. When Something Special first started, I could see that lives were being transformed through innovative teaching methods. We had young people, who had rarely engaged in conversation or social interaction and had very little confidence in themselves. Denise was nominated for the award by Pauline Greene, who said: “Denise is a huge inspiration to the local people and she has given a musical voice to some very special people and has tapped into something which she saw had the potential to make a real difference to the lives of the young people who needed it most. Denise is the first of five Unsung Hero Award winners to be announced. The remaining four winners will be announced on Radio 2’s Steve Wright Show throughout the week. The recipients are invited to Glasgow on Friday, June 5, to be in the audience of ‘The One Show’ which is coming live from the BBC Music Day celebrations at Pacific Quay. Later that evening, at Glasgow City Halls, they will be guests of honour in the audience for Radio 2’s ‘Friday Night is BBC Music Night’, a special gala concert hosted by Ken Bruce and Katie Derham.